A few weeks ago, the World Health Organization (WHO) released a report and made a statement about bacon and other processed meats. The news was not good. The WHO has determined that consuming bacon and processed meats can increase a persons chance of developing of cancer. Specifically colorectal cancer. On reading this news, I had a few different reactions. I lost my mother to colon cancer 5 years ago - which made this a hard announcement to simply ignore. My first instinct was to deny the news - processed meat has always been a reliable friend to me and my family. Sandwich meat has been has been happily filling my girls' lunch boxes. My next reaction was to go into full on panic mode - ban sandwich meat and processed meats entirely. Since my initial "ban all processed meat" panic, I have decided to take a more deliciously balanced approach. While there is not an outright ban on sandwich meats and bacon from our diet, we have been seeking out family-friendly alternatives. This is how I created this quick, easy and inexpensive chicken and pork roasting preparation to our weekend routine. 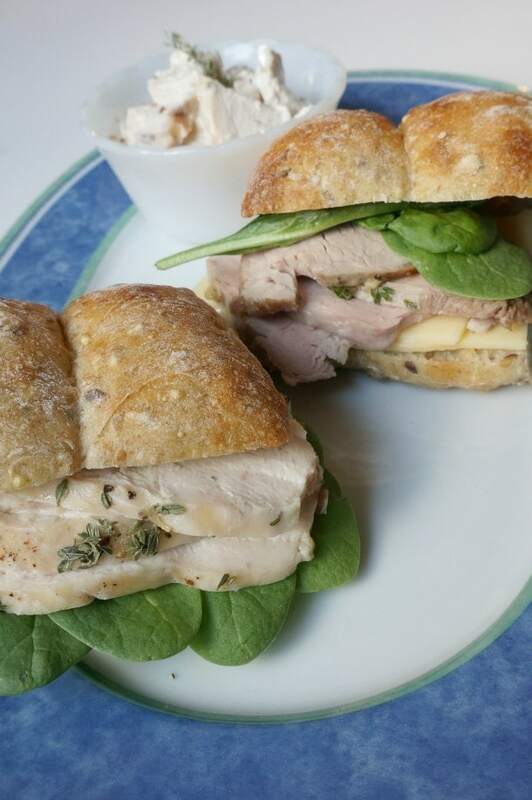 In around 20 minutes on Sunday, or Monday night, you can have two freshly roasted chicken breast and a pork tenderloin to create an entire week's worth of sandwiches. 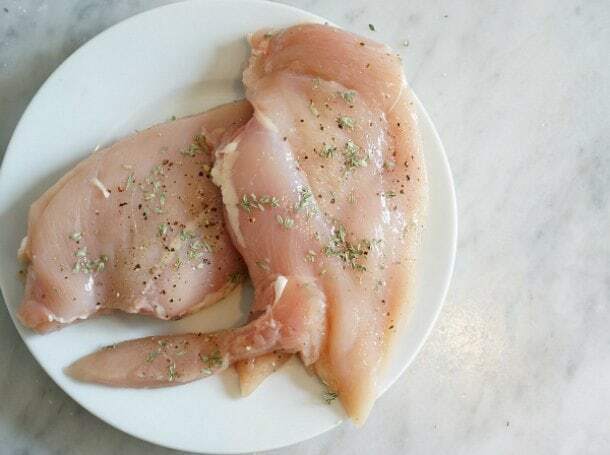 Prepare the chicken breasts by placing them between 2 sheets of parchment paper and use a mallet, or the back of a wooden spoon, to pound and flatten the chicken breast. The idea is to pound the breast until it is an even thickness, this will help the breast cook quicker and more evenly. Repeat with the second breast. 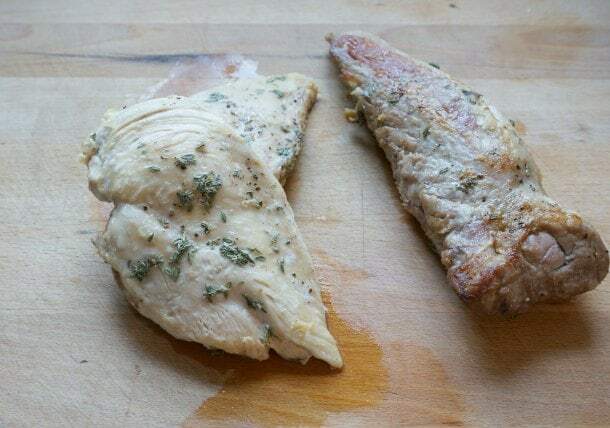 Sprinkle breasts with 1/2 tbsp of thyme, salt and pepper. Set aside. Prepare the tenderloin. Roll tenderloin through 1/2 tbsp of thyme, salt and pepper. Set aside. Place oil in an oven safe sauté pan, and warm over medium-high heat. Once the pan is hot, place chicken breasts into the pan. Brown each side of the breast, approximately 2-3 minutes a side. Once browned, remove from pan and set on a parchment lined baking sheet. Place the baking sheet into the oven, on the bottom rack to continue roasting the chicken breast through. Remove from oven when breasts are cooked through, about 10 - 15 minutes. While the chicken is in the oven, place tenderloin into the same hot sauté pan. Brown each side of the tenderloin - about 5-10 minutes to brown entire tenderloin. Once browned, place the sauté pan and the tenderloin into the oven. The tenderloin will finish roasting in the oven. Roast until tenderloin's internal temperature reaches 160°F. Remove tenderloin from the oven and set on cutting board to cool before slicing. Once the chicken and the pork are cooled, slice the meat however you like and store in resealable containers in the fridge for 4-5 days. Turn the chicken into a simple chicken salad by tossing chopped chicken in a bowl with 1/4 cup mayonnaise, 1 tbsp lemon juice, sliced grapes, sliced celery stalk, salt and pepper. Feel free to marinade the meat before cooking. Use your family's favourite marinade or experiment with different herb and spice rubs. While processed meats may seem quick and inexpensive, getting in the habit of making your own roasted meat for sandwiches can be just as easy and affordable. Life is all about finding a balance. This recipe helps busy families find a new balance for healthy lunches.